Did you know that you are just a click or tap away from new and improved online data logger assistance? If you have a CR1000X, CR6, or CR300-series datalogger, you’ll want to visit our new resource that is available to you 24/7. Our new online user assistance resource offers you searchable, easy-to-use instructions and information. Whether you are looking for Getting Started instructions or are delving into the details of a data logger specification or measurement detail, this resource empowers you to quickly find answers to your data logger questions. Gone are the days of downloading and searching through PDFs to find the page with the answer to your question. You can also say goodbye to the days of hoping "that one colleague who seems to know everything” is available to provide the sought-after information. 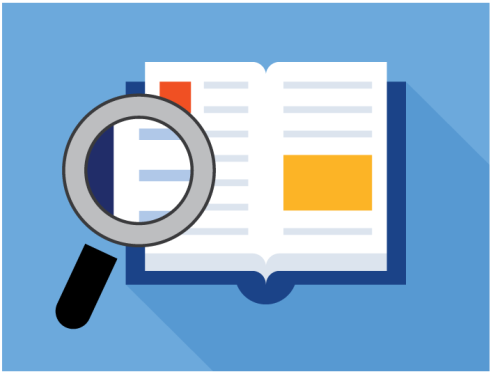 With its powerful keyword-searching capability, you don’t have to rely on documents or colleagues for help. Because this user assistance resource exists on the web, you can access and search a wealth of data logger information on your desktop, notebook, mobile phone, or tablet—when you need to. Go to the Campbell Scientific web page for the CR1000X, CR6, CR300, or CR310 datalogger. 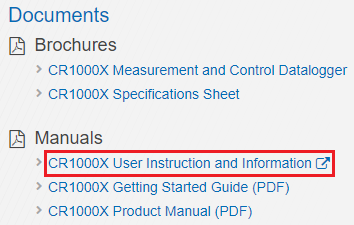 Navigate to the Documents | Manuals section. The online resource will open in a new tab in your browser. We are excited to offer this resource and provide another way for you to access the information you need, when you need it. This online resource is new, so it currently offers instructions and information for only a few data loggers. We are adding new content regularly to this user assistance resource, and our goal is to expand the information available to you for a wider variety of products. As you use this online resource, let us know how we can make it more helpful to you. Please post your comments below. As a Technical Communicator at Campbell Scientific, Inc., Michelle Welch was our resident content wrangler. She worked as an expert user solutions provider, developing powerful, single-sourced, user assistance applications for Campbell Scientific products. When she was not working away behind a plethora of monitors, Michelle could be found camping, fishing, and enjoying the outdoors. C'est une très bonne initiative ! Merci merci. Merci! Thank you for your feedback! We recently also added searchable, online help for the CR300 Series CRBasic application here: https://help.campbellsci.com/CRBasic/CR300/. If this is helpful to you, or you have feedback or recommendations for improvement, please feel free to post a comment.